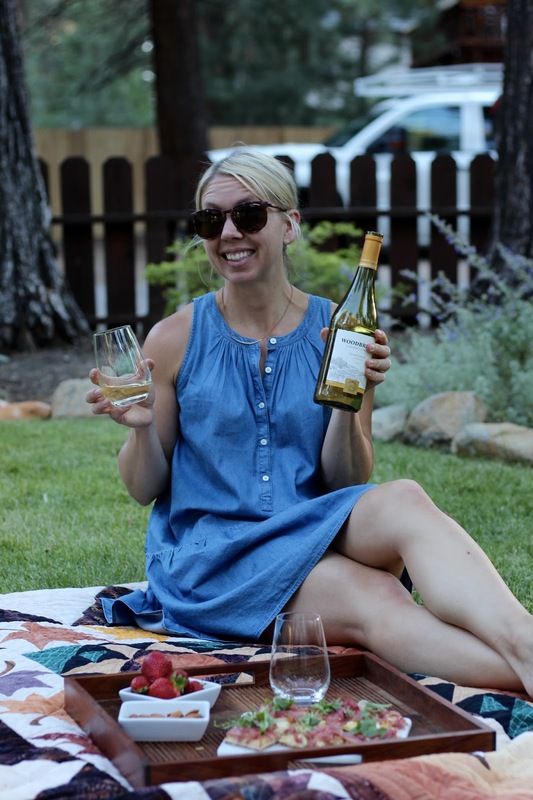 Warm summer nights call for picnics in the front yard and BBQs with friends. I don't know about you, but I'm a fan of testing new recipes before making them for a party. 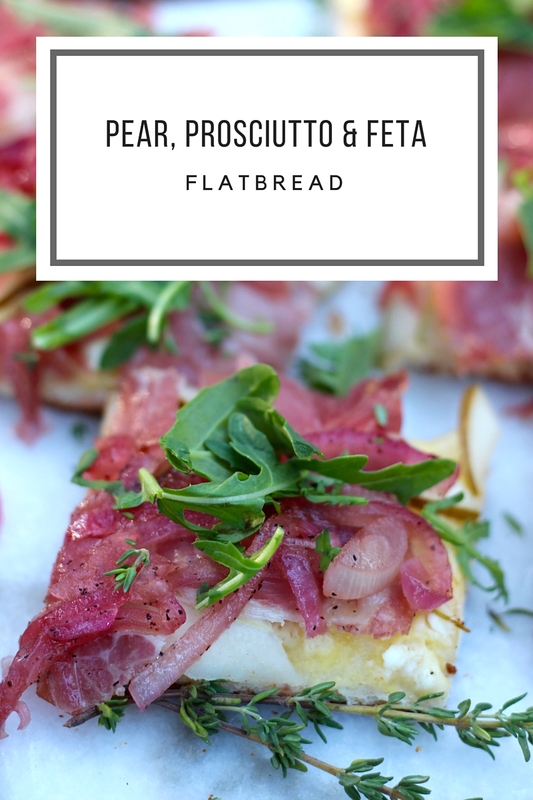 With that said, I just made the tastiest Pear, Prosciutto and Feta Flatbread that will definitely be a winner at the next BBQ, girls night in or a simple 'friends' dinner. However, the key is enjoying it outside, with friends and paired with the perfect wine! Oh, you didn't think I would forget about the wine?! Yup, no shame in my game... we've been enjoying Woodbridge by Robert Mondavi. Not only did it pair well with the flatbread, but it's perfect for cooking! Woodbridge by Robert Mondavi has been around for over 30 years making it a brand that you can trust when sharing with a friend. Can we talk about the flatbread for a minute? I'm not going to lie it was pretty amazing and I can't wait to have it for lunch today. After a long day at work yesterday it was super quick and easy to make. Plus, I was impressed by the gourmet taste, presentation, and budget friendly cost. win-win in my book. So what are you waiting for. 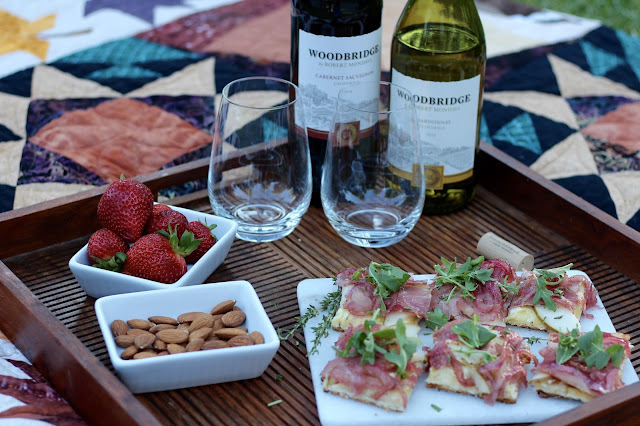 Fire up the BBQ, make some flatbread and open a bottle of Woodbridge by Robert Mondavi Chardonnay. Preheat oven according to directions on pizza crust package. Lightly cover 16x14 baking sheet with cooking spray or pizza stone and roll crust. Bake crust 8 minutes, or until lightly golden brown around the edges. Remove from oven and set aside. Heat oil in a saucepan and sauté red onion over low heat until onion begins to soften. Add wine, honey, salt and pepper; simmer until liquid is nearly gone. Combine egg and feta cheese and spread over crust. Layer pears, prosciutto and onions. Bake 8-10 minutes or until crust is golden brown. Top with thyme and and arugula. 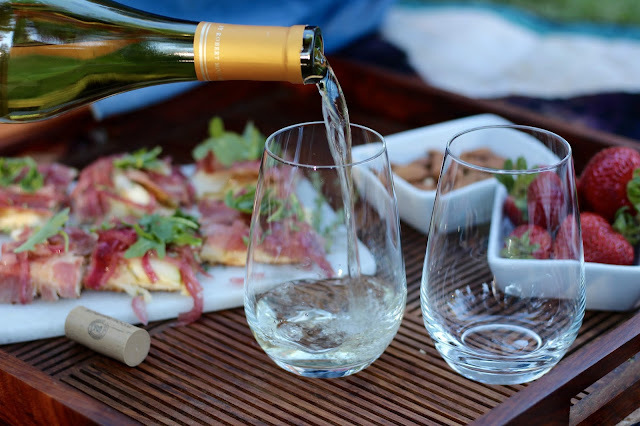 Looking for more entertaining and wine inspiration? Get inspired at the Simple Entertaining Social Hub. This looks really good! I love everything about it! Looks so darn yummy!! Adding this to my list of summer recipes to try! Looks fabulous! Will be trying soon! Every last ingredient is perfection! Can't wait to try this! Oh my that looks absolutely scrumptious! Love this! That looks amazing and the wine pairing is fantastic. This looks so good. I love prosciutto! I will have to make this soon! I love these ingredients - looks delicious!! This flatbread sounds amazing! I love feta, pear, and prosciutto so I can't wait to try it! Yum! What a great recipe for summer entertaining. So cute! Who needs Napa when you've got your front yard?